If you are interested in building wine cellars, Cellar Creations has the knowledge and experience to create your perfect cellar. While some connoisseurs like to wipe the dust from their carefully cellared bottles in rugged, natural surroundings, others seek stylishly finished wine cellars in stone or timber, perhaps where they can entertain friends. The style you choose is yours. We will design and build a cellar to reflect your needs, and equip it with effective racking systems to suit your budget and sense of style. 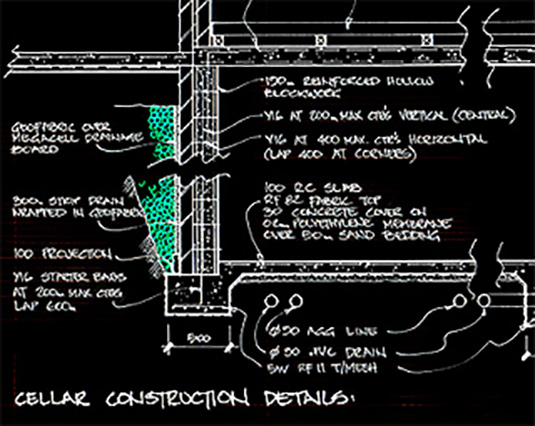 As Registered Building Practitioners, Cellar Creations will look after your entire project. The whole job will be managed and handled by us from start to finish, so there will be no need for you to engage other contractors to complete aspects of the project. You will be dealing with our Project Management team who will handle all aspects of construction and consult with you from the moment work begins. There are two ways to engage Cellar Creations in completing your future wine cellar. Fully engage Cellar Creations to look after the complete process from design concept through to building completion. The wine cellar needs to be bigger than 10 face sqm of wine racks to qualify for this service*. Contract Cellar Creations to manufacture hand crafted wine racks. Minimum order is 10 face sqm*. * The qualification of 10 face square meters enables us to be viable and competitive. 10 sqm represents a face space of approximately 2400mm high x 4.16 long and hold approximately 1000 bottles.